Our aforementioned love of Wetherspoons was further cemented on Friday, we begun our weekend early, and with style, with a sophisticated luncheon at our local Spoons. We opted for a what the menu calls a: “dog” . 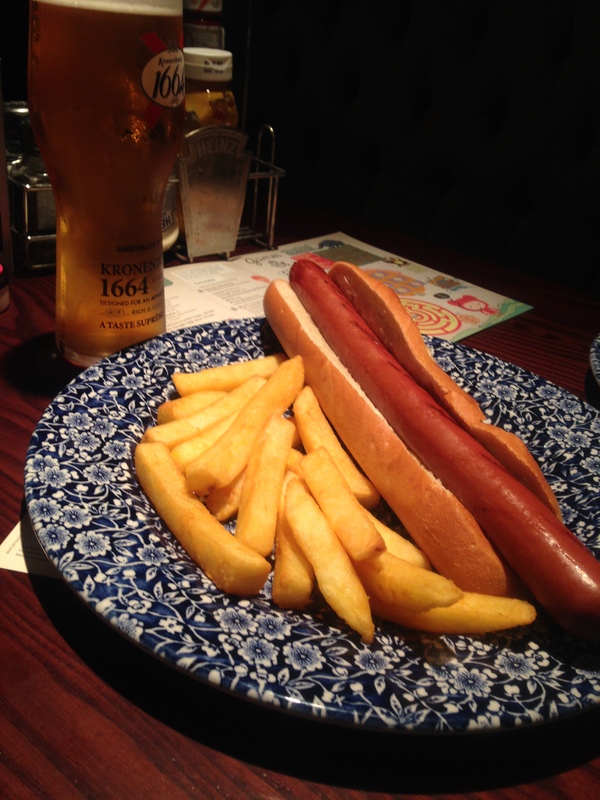 A hotdog with chips and an “alcoholic drink”, (we both had a Kronenbourg) comes to a grand total of £5.49. The price is indeed right. Once we had our refreshing pints and had given our table number, our wait for our “dogs” was minimal, about seven minutes. Our eyes drawn to the kitchen door as the busy waitors flowed in and out, we were filled with expectant glee when we saw our meals being carried towards us. We had opted for the simplest available ‘dog’, just a plain hotdog in a baguette to which we added our choice of sauces but Spoons also has optional add-ons such as cheese or chilli. The chips were usual Wetherspoons heavenly goodness, crisp on the outside and fluffy in the middle. The dog was generous and filling. A sausage wrapped in a delicious bun. We assume that this meal has been a hit on the Wetherspoons menu since we espied many a customer who shared our choice of midday meal. We felt sated and, unlike the splendid breakfast served by Spoons, the meal was not a hugely salty affair. This ‘dog’ was barking up the right tree. We opted for a what the menu calls a: “dog” . A hotdog with chips and an “alcohol drink”, (we both had a Kronenberg) comes to a grand total of £5.49. We felt sated and, unlike the splendid breakfast served by Spoons, the meal was not a hugely salty affair. This ‘dog’ was barking up the right tree.